Carnitine Biosynthesis, Metabolism, and Functions contains the proceedings of the Virginia Lazenby O'Hara Biochemistry Symposium held in Dallas, Texas, from March 31 to April 1, 1979. 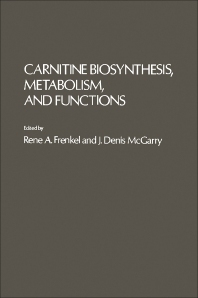 The papers explore all aspects of carnitine metabolism, including its biosynthesis, regulation, transport, and functions. Comprised of 24 chapters divided into four sections, this book opens with a brief review of the situation which led to the discovery of carnitine as a vitamin and its role in acetylation. The discussion then turns to the chemistry and biosynthesis of carnitine in Neurospora crassa, rat kidney, and humans. The purification of enzymes involved in the conversion of trimethyllysine to trimethylaminobutyrate is also considered. The following chapters examine carnitine transport across the plasma membrane; formation and utilization of isobutyrylcarnitine; regulation of blood carnitine and carnitine acyltransferases in the perinatal period; and inhibitors of carnitine transport and metabolism. The final section is devoted to medical and clinical aspects of carnitine, touching on topics such as the possible causes and effects of carnitine deficiency in humans; carnitine deficiency in cirrhosis; protective effects of L-carnitine on ischemic heart; and changes in carnitine-linked metabolism during ischemia, thermal injury, and shock. This monograph will be a useful resource for biochemists and those interested in the physiological roles of carnitine.